Becky Ward will be home on St. John for Thanksgiving, but it’s a homecoming tinged with heartache. 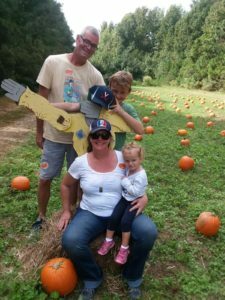 Though she; her partner, Patrick Rooney; and their two-year-old daughter, Hazel are returning, Patrick’s 10-year-old son, Jack, is staying behind in Virginia where he is now living with his Mom and grandparents and is enrolled in a new school. “We are both really happy to go home on Tuesday, but we’re really sad to be leaving a part of our family behind,” says Ward. More than two months after the one-two punch of Irma and Maria, St. John and its residents are in transition. Since evacuating after Irma, Ward and her daughter have bounced all over. First Virginia with Jack’s mom, then North Carolina with her sister, then Oklahoma with her mother, then back to North Carolina. 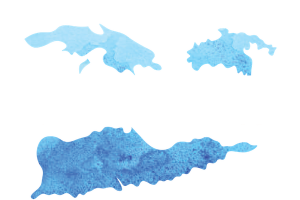 The island itself is changing daily and is a study in contrasts. Flowers are blooming, and everywhere you look there’s green growing up and around piles of trash and debris that used to be somebody’s home. The lights are on in parts of Cruz Bay, and power is making its way up the hills, but everyone in Coral Bay is still in the dark. The beach at Hawksnest is officially open, but Maho is unrecognizable. And while some parts of the island feel almost normal, others, especially in Coral Bay and the East End, still look like the epicenter of a Category 5 storm. “You really were in awe of the force of Mother Nature,” says Rebecca Reinbold whose family survived Irma by barricading themselves inside a concrete storage room at her mother’s house in Hart Bay. Among the group taking shelter was Reinbold’s four-year-old son, Hunter. 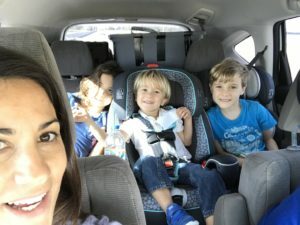 St. John mom Jayme Gottschall; her husband, Robert; and their three children, 9-year-old Gianna, 6-year-old Cruz, and 3-year-old Cormac were in Albany, NY with her parents when Irma hit. “We didn’t really get to figure out our emotions for a while because we were just super-preoccupied with – is everybody alive?” says Gottschall. What are we going to do now? Answering that question is stressful for any hurricane victim, and for many who chose to evacuate with their children before a second storm hit, the stress mixes with guilt. 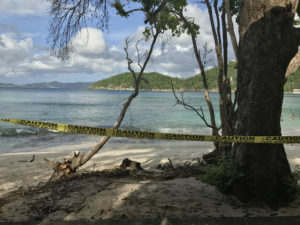 “Your heart is in St. John and you want to go back, but is it viable?” says Reinbold, who describes the decisions that many residents have had to make as, “heartbreaking and financially terrifying.” Even thinking about enrolling her son in school in California made her feel like she was “deserting St. John,” she says. Gottschall says she and her husband “basically fought for a solid month and a half” before deciding to accept the Westin’s offer to relocate the family to Orlando. They plan to stay in Florida for a year and then, hopefully, move back when the Westin St. John reopens. Ward says she’s excited – and anxious – about returning to St. John. 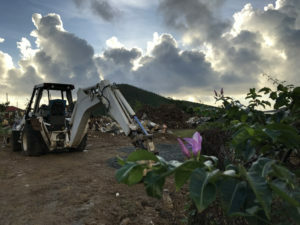 Ward says that she, Patrick, and Hazel plan to spend part of Thanksgiving in town where the St. John Community Foundation and other organizations and businesses are hosting a free dinner for residents as well as all the volunteers, linemen, and relief workers who have been helping the island rebuild. Coral Bay is also holding its annual “Thankspigging” feast. “It kind of stinks being away from all your friends and your community, but it is what it is,” says Gottschall, apologizing for sounding down. Her family will miss the potluck Thanksgiving they usually have with their St. John friends, she says. She’s hoping life will be a little more normal for her kids by December. Reinbold is back on St. John now. Her son is in school on St. Thomas and she’s working with Love City Strong. She says she’s grateful to be reunited with her family and friends. 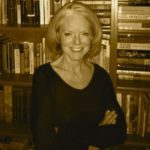 Margie spent 14 years as a television news reporter and anchor, winning a few Emmys and covering thousands of stories about every subject imaginable. Like Hildy Johnson in His Girl Friday, she got tired of the news business and quit, first working in non-profit communications and media relations for several years, then moving to the Caribbean where the editor of the local newspaper stalked her at her waitressing job until she agreed to write for him. Since returning to the States, her assignments have included reporting and anchoring for CBS radio, writing about the performing arts, and teaching journalism. This website is FOR SALE! Buy What To Do – VI and buy a perfect work from home career in paradise. Tell Me How To Buy!Hint: It's affordable!